The Harbour porpoise is a common cetacean in our waters. They travel around in small pods feeding on fish just off the coast. They are much smaller than native dolphin species and more difficult to spot. However, with patiencs you can learn to spot them in the water and see them regularly along the coast. They do not often leave the water like dolphins but ‘breach’ with their back in a smooth arc. Porpoise have a very short beak making their head look blunt compared to a dolphin. 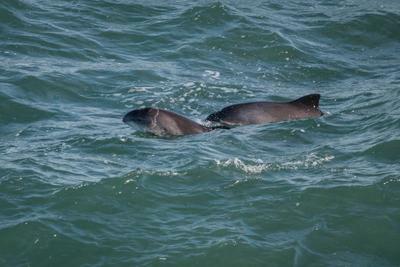 Swansea Bay is a particularly important area for porpoise and mothers with calves are regularly seen. For more information see the ORCA Harbour porpoise page.